This weekend I had the privilege of travelling with Answers in Genesis Australia & New Zealand up to Gladstone to work with Faith Baptist Church at an outreach and also to speak at their Lord's Day service. The outreach was just south of Gladstone at the BAM markets. When we arrived, we set up our Answers Missions table, and began to hand out tracts and talk to people. As I was setting up, a lady approached and began to fire questions at me. As she spoke, it became clear that she was part of the Jehovah's Witnesses, and she wasn't happy that we were out spreading the message of the Bible. But of the Son he says, “Your throne, O God, is forever and ever, the sceptre of uprightness is the sceptre of your kingdom." At this the lady yelled, “You are trying to confuse me! Jesus isn’t God!” With that she stormed off. Sadly, the JW cult has their talons in her and has blinded her to the truth. May the Lord Jesus open her blind eyes. The commotion seemed to have attracted some attention as two teenage boys stopped to talk. One of them said he goes to church and loved what we were doing. The other said he was thinking about attending church. I chatted with these young men and soon discovered that they believed they had to be good in order for God to save them. We chatted about the gospel and how Christ can save all those who repent and trust in him. At this point one of the teenagers said, “I really wish mum and dad could hear this! What can I give them?” We were able to give both of these men a copy of the Gospel of John and also some literature. They were very thankful as they went their way. 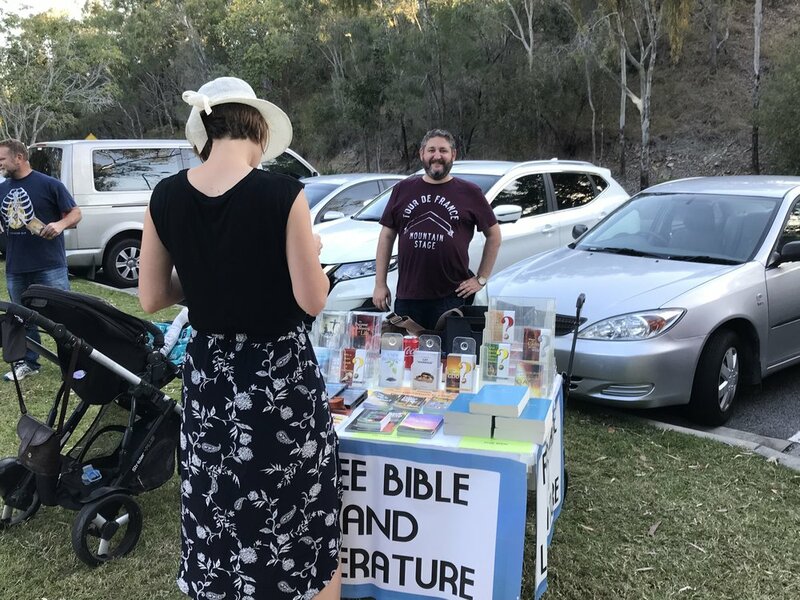 By now we had a steady stream of people coming up to the table to take Bibles and literature. We also had team members walking around handing out tracts, which were very readily received. I was told later that over the course of two hours, the team distributed hundreds of gospel tracts and had many gospel conversations. I set up the flip chart near the table and used that to engage in conversation. Sometimes we had 2 or 3 people stop to talk, then at other times we had a crowd of 13 teenagers all crammed around the flip chart to listen to the gospel presentation. Toward the end of the day, I noticed a young lady browsing all the material on our table. I spoke with her, and she told me, “I have never been to church, and I have never heard of Jesus. Who is He?” Here was a young lady who has lived her whole life in Australia but has never heard about the God who made her, loves her, and is prepared to rescue her from her sin. This shows that our Western countries are in desperate need of missionaries. I chatted with this young lady, and she took a big pile of our free literature. Please pray that the Lord will save her. It was a joy to conclude our time in Gladstone by preaching on “The Relevancy of Genesis and the State of the Culture” at Faith Baptist Church. There was quite a number of people who attended, with many visitors coming along. After the message, a young lady approached me to share how she came from a non-Christian background, but after spending months reading the Answers in Genesis website, she was converted. A particular highlight for me was that a very friendly atheist attended. He had listened to some of my sermons online and watched videos. He was one of the nicest chaps I’ve ever met. He disagreed with what I said, but he was very open to reading and learning more. Please pray that the Father would draw him to the Son.